Echo Death is the game I am most excited to sit down, update and flesh out. Originally the idea was players were Wizards or Sorcerers who cast spells through interchangeable minions/vessels. But I moved away from that theme to one of Hackers using Nodes (such as a cell phone, computer terminal, even a smart fridge) to execute various programs and tasks to crush their enemies and win territory from other hackers. I love the concept and theme. There are elements from the movies Hackers and Johnny Mnemonic and Tron Legacy (and the original), the games Uplink and 868-HACK, the card game Netrunner, the book Snowcrash. I also really like the mechanics because they are vastly different than what I’m used to. First of all the game is entirely diceless. Second of all there are elements of “deckbuilding” by choosing the programs you have available. In general players have 10 Nodes each and a catalog of 8 Programs (split into Command [Instant] or Task [Ongoing]). The Nodes begin the game completely the same in terms of stats and features. Choosing your Programs is a bit like army or deckbuilding as you’re trying to anticipate what your opponent will bring, cover various situations, and have good synergy internally. A good way to think of the game is Chess where you choose/buy the movement types and “rules” of each piece. The game is played on “The Grid”, which is a board/map of 1″ squares. “Features” can be added by placing tokens facedown at the players discretion, then flipping them and seeing the “terrain” feature (such as a protective zone, jump pad, etc.). The focus of each turn is to spend Instructions (aka action points) to move Nodes and execute Programs on them or the enemy. There is an initial “buffing” phase where you can prepare some Program tasks on various Nodes to give them more attack, defense, resistances, movement, etc. I envision each player using whatever they want for Node markers, from simple cardboard to 28mm miniatures to random pieces from other boardgames. This works thematically because The Grid is a virtual overlay for the real world, so the Node “pieces” are avatar representations. Generally turns are 90% planning and 10% execution, because there isn’t a phase of lengthy dice rolling. If a decision has to be made the players use their “Hack Deck” (which is basically plain cards 1-10 of a suit), which has a system of bluffing, guessing, and wagering when a Hack is important or not. Such as do I care enough to use my 8 value card to achieve this Hack? Will the opponent even bother blocking it or can I get away with a 6 card? There are some additional rules like a once per game interrupt called a Disconnect that stops a program/instruction set. There is a lot of room for customizing each match by having more/less Nodes, Programs, Instructions per turn, etc. All in all Echo Death is one of my top priorities that I want to revisit. The rulebook needs a complete rewrite and format as it’s still littered with fantasy spellcasting concepts, pre-name change notes, and very rough brainstorming. I have a bunch of playtest notes written by hand that I need to transcribe and apply. This game is great for stretching me as a designer. What I mean is I am used to writing rules for moving and shooting and rolling dice. I’m not as used to the rules and mechanics in this game. So the rulebook doesn’t flow as well as it normally would, and I’m torn on a lot of concepts and ideas in the game. Echo Death is also a bit hard to playtest solo. Because of the deterministic diceless system and element of bluffing with the Hack deck it’s hard to get a good feel for what each side would play like. I’m really excited to create media and graphical elements for this game. 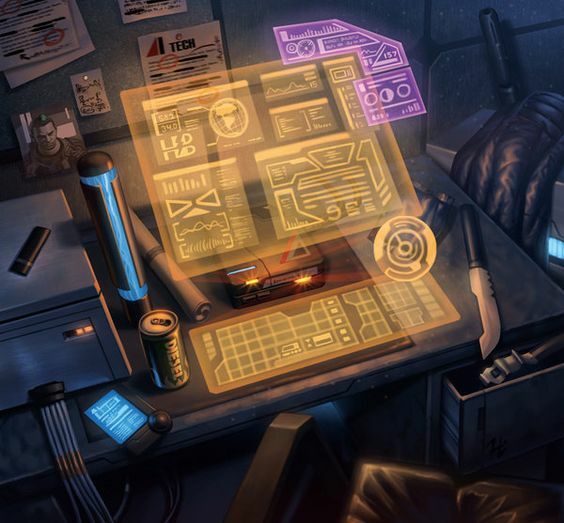 I could see taking photos from Google Maps, making them “computery” with some kind of techno grid over top, and printing that as a laminated map. Similarly the Instruction tokens could be old bits of motherboards or keyboards or something. Just a lot of options for cool theme. I also was working on the Life of a Dinosaur Cowboy RPG around the same time as this concept, which resulted in a lot of bleed over of ideas from Echo Death to that game. Most notably the “instruction pool allocated to multiple entities” and the idea of picking/buying your own abilities.